‘U-topia’ is literally ‘no-place’ and Sir Thomas More, who wrote the original Utopia in 1516, was well aware that his ideal society was a dream. Dreams have value, however and More’s has been followed by many other visions of ideal political or social perfection. Somewhere along the way, the negative ‘U’ or ‘Ou’ blurred into the ‘Eu’ of ‘good’ or ‘beautiful’, and attracted an opposite, ‘Dystopia’, a ‘bad place’. Aldous Huxley created one of the most famous of these, of course, with Brave New World (1932). From that low point, he turned in search of better ways of living, joining the pacifist movement, taking up Vedanta, befriending Krishnamurti and investigating psychedelics (The Doors of Perception, 1954). 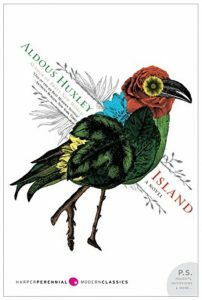 His last novel, Island (1962), presents an ideal society based on his discoveries during the thirty years since Brave New World. I read it when I was in my late teens or early twenties and have carried mixed memories of it ever since: that I liked his ideal society but didn’t find his book so appealing. When I spotted a new edition in my local library, I picked it up to see how it, and I, might have changed. Pala, Huxley’s paradise, is a small tropical island in the Indian Ocean. The local religious beliefs are a happy mix of Hinduism and Buddhism, and in that regard, as in many others, Pala resembles Bali. As the book begins, Pala’s nearest neighbour, Rendang, is ruled by a corrupt, expansionist dictator, Colonel Dipa. Pala escaped colonisation by European powers and the crucial element in its development is that in the early nineteenth century its hereditary ruler, the Old Rajah, collaborated with a Scottish doctor, McPhail, in setting Pala on a new course. McPhail’s European science, intelligently applied, improved health and education, while the rajah’s spiritual wisdom maintained and extended the islanders’ social wellbeing. Almost everyone on the island is happy with the results. Unfortunately the young rajah-to-be has been educated overseas by his repellently foolish mother, rejects what he doesn’t understand, and is enamoured of Colonel Dipa’s ‘modernisation’ plans. The novel’s narrative is slight: Will Farnaby, an English journalist, is washed up on Pala and is shown around by Dr Robert McPhail, grandson of the original doctor, and his recently widowed daughter-in-law Susila. Farnaby, much to his surprise and somewhat against his inclination, is convinced of the merits of Palanese way within a few days – but then Colonel Dipa invades at the young rajah’s invitiation, and the book ends with Farnaby and Susila listening to loudspeakers proclaiming the glory of a Greater Rendang. Nearly all of the rest, and it’s not a short book, is Will’s introduction to Pala’s history and culture. It is very heavily didactic and is, I’m sure, why I remembered the island more fondly than the novel. Wikipedia defines Huxley as a ‘writer, novelist, philosopher’ and ‘one of the pre-eminent intellectuals of his time’, and putting his novels second doesn’t seem unfair. Most of his mature work was in short nonfiction and (perhaps unexpectedly) in screenwriting – which leads me to a thought that Island might be even better as a movie than as a novel, since Huxley gives us a small cast of well defined characters and the ‘what’ of the island could be simply shown while the ‘why’ is explained in his expertly-written dialogue. Be that as it may, Huxley’s utopia impresses me even more now than it did years ago. The recipe? Take one relaxed pre-industrial society; add science, education, and health care; prioritise social development, especially self-knowledge, over technological development; and keep the modern world at a distance, adopting only what leads to greater happiness. The core of Huxley’s educational curriculum is a self-knowledge based on Buddhist and Hindu principles. It is systematically taught in primary schools and augmented by a mescalin-like drug which gives all adults direct access to a mystical experience of blissful connectedness to the universe. But respect for each other’s wellbeing extends to respect for all life and to maintaining the vitality and harmony of the environment, and the result is something Huxley may not even have had a word for: sustainability. Huxley was aware of limits to growth in terms of population and resources, and made sure his original Dr McPhail knew of Malthus but the additional limits imposed by climate change have only emerged since Island was written. The green movement has necessarily focussed on harm reduction for the last thirty or forty years but the essential next step is to re-imagine our world as one which has learned to say ‘enough’ to consumption and to live within its means. One of the most attractive things about Huxley’s vision is that it is such a simple, positive and, in principle, achievable model of a such a society. While it’s probably a coincidence, there actually is a movie called ‘The Island’ which is set in a dystopian future society. It has almost nothing else in common with Huxley’s book, except that it’s arguably a rejection of an authoritarian, modern ideal. I guess you mean the 2005 movie, https://en.wikipedia.org/wiki/The_Island_(2005_film) (There are a couple of others.) Islands are very convenient plot devices, so it’s it’s not entirely a coincidence, but I can’t see much of a connection apart from that. Dystopias though … The Water Knife http://malcolmtattersall.com.au/wp/2016/03/water-knife/ qualifies, but there are more I want to write about.